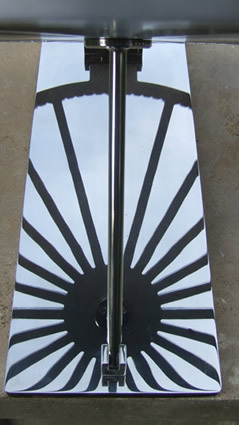 Order stainless Skywheel Equatorial sundial and pay 50% deposit. 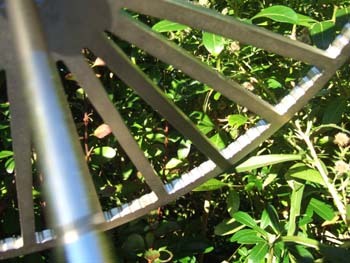 The Skywheel is an innovative sundial in the form of a wheel with 24 spokes, one for each hour of the day. And, precisely on each hour, the shadow of the central rod falls exactly along one of the spokes. 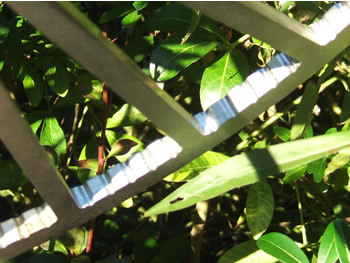 Each Skywheel is individually made for its exact location. There is ample space for extensive personal engraving, including images or logos if required, on the mirror-polished baseplate. 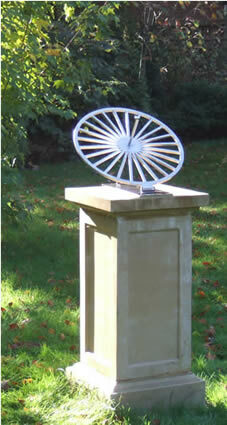 Delivery of the Skywheel is normally around 6 weeks from the time the engraving is finalised. These pictures illustrate the standard 48 cm. skywheel which is supplied with a 42 cm. 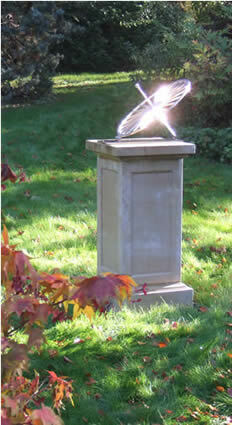 square mirror-polished baseplate which can be engraved to your specific requirements. Here, the shadow is nearly exactly between the nicks which means it is 15 minutes past he hour. The standard 48 cm. Skywheel is priced at £2900 including the standard baseplate, and UK mainland delivery. The standard baseplate is 42 x 42 cm. but larger baseplates can be supplied if required. The baseplate can be specially engraved if required with text, logo or pictures at extra cost. For ordering information, please click here. Click here for more images of the Skywheel.